Recently one of my friends sent me a link on Whatsapp. Asking her what it was, she told me KFC was giving away Rs500 gift vouchers. Who wouldn't like to get such a gift? Once I clicked on the link, I was directed on a page with the official KFC logo where I was asked to complete a 5 questions survey. Below are the screenshots of each page of the survey. After completing the survey, I was asked to share this with 10 Whatsapp contacts. They even provided a share button for that and below it, a continue button. Clicking on the continue button, you are asked to provide an email address. Once you enter your email, you would receive a series of emails containing unknown links to unknown websites. Cybercriminal behind these types of scams usually earn money for each time a person complete the survey. 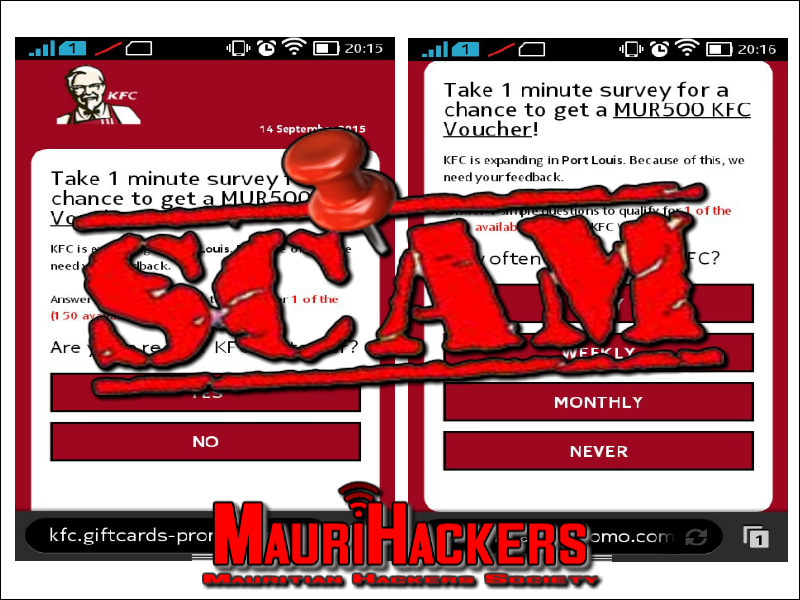 We advise our readers to ignore the KFC Gift voucher, THIS IS SCAM. Below are the links where i was directed.